I finished the first part of Agatha Christie's Autobiography [the book has three parts which are split by two sets of photographies] yesterday. Yes, I really know it isn't important for the World, but I'm really proud of it. I have read it for five months - so long time, because I didn't keep my own obligation: to read at least one page every day. I must say that I have these Akunin's books in English not to be pride oneself. 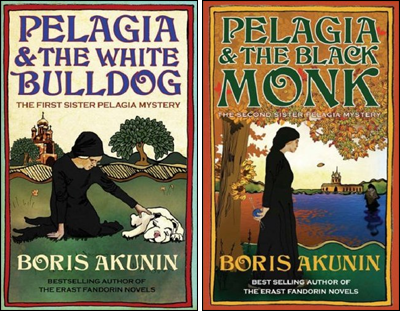 Unfortunatelly Boris Akunin is not as known writer as I would like he would be in Czech republic hence I guess the Pelegia series will probably not appearance in Czech at all. Though Albatros publishing [publisher of Akunin's Erast Fandorin series] finished the Harry Potter series finally they could start to publish the other books too.